This is the most beautiful place in the Sandprints complex. The first thing you will notice when you walk in the door is how the living room and kitchen are so open and airy. The entire first floor has been tiled. The kitchen has granite counter tops with an Italian designer-tile back splash, a beautiful stainless steel sink with high-end brushed silver faucets and matching light fixtures. The living room has a flat screen TV and DVD player, which can be viewed from the living room, dining room or the kitchen. All 3 bathrooms are tiled with granite counter tops and inset sinks. The two showers have been tiled from floor to ceiling with an Italian designer-tile look and feel. All rooms have been freshly painted, crown molding, eight inch base boards with pocket lighting throughout the unit. Flat screen TVs are in both the master bedroom and the guest bedroom. New carpeting has been added to the second floor. LOCATION! LOCATION! LOCATION! What could be better than being just a few steps from the most beautiful emerald green waters and white sandy beaches, shopping, malls, eateries, golf, fishing, and many other water activities? Well, our beautifully furnished and well maintained condo is just the place for you to experience all this and more!! From our private patio off the kitchen, enjoy your morning coffee and in the evening your marguerita watching the beautiful sunset. Just one short walking block is the public beach offering chaise lounges, umbrellas, clean restrooms and showers also adjacent is the famous Pompano Joe Restaurant and Tiki Bar Grill. If the pool is more your choice, the unit overlooks this area which is complete with tables, chaise lounges, umbrellas and restrooms. Either case...all you need is your towel and suntan lotion. SANDPRINTS complex is quiet and family oriented. COME AND ENJOY A BIT OF PARADISE AT SANDPRINTS - UNIT D-8!! picture unavailable at at this time. This unit is co-owned with my husband, me, and our son. 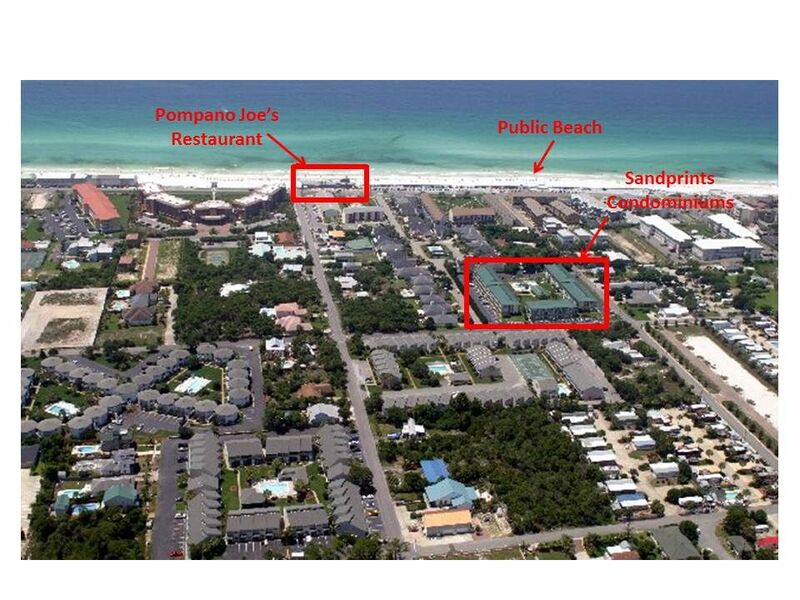 We purchased the condo unit in 1990 and have thoroughly enjoyed every aspect of Destin. Its gorgeous! We fell in love with the most beautiful beach in the world. The water is a deep emerald green. The sands are powdery white that glissen in the sunlight. And such spectacular sunsets. Nothing beats Miramar Beach. Besides the beautiful beach that is just a block from our condo, the famous Pompano Joe restaurant is a few steps away where you can get a fabulous marguerita, a sandwich or full dinner. There are also lounge chairs with umbrellas for a small fee of the day or a few hours. There are just about any kind of stores you can name, from a Wallmart to Chico's and the like. All kinds of sports are close by, fishing, parasailing, golfing, tennis, etc. This unit is lovely and very well kept! It has all the amenities you’ll need to enjoy your vacation. I truly felt at home.. The area is great, quiet, close to everything, within walking distance to a beautiful beach, but away from the hectic tourist traffic. The condo is well equipped with just about anything you may need. Definitely worth the stay here. The owner is easy to work with and responds very quickly. Definitely recommend. We had a wonderful vacation at this condo! :) It was very clean. We loved the downstairs and the updated bathrooms especially! We would highly recommend it to anyone. Location was convenient to the beach, with short walk. Loved open concept and layout of condo. Sparc bed liens for sleeper sofa. Nice pool. Good value for multi family. Nice, comfortable condo. Liked the upstairs bedrooms. Easy walk to the beach. All the amenities of home. Really enjoyed our stay. Owner was easy to work with. Shop or fish 'till you drop!!! Golf, Skidoos, Water park, you name it, we got it! I only rent for full weeks (Saturday to Saturday) during the prime summer season of June and July.